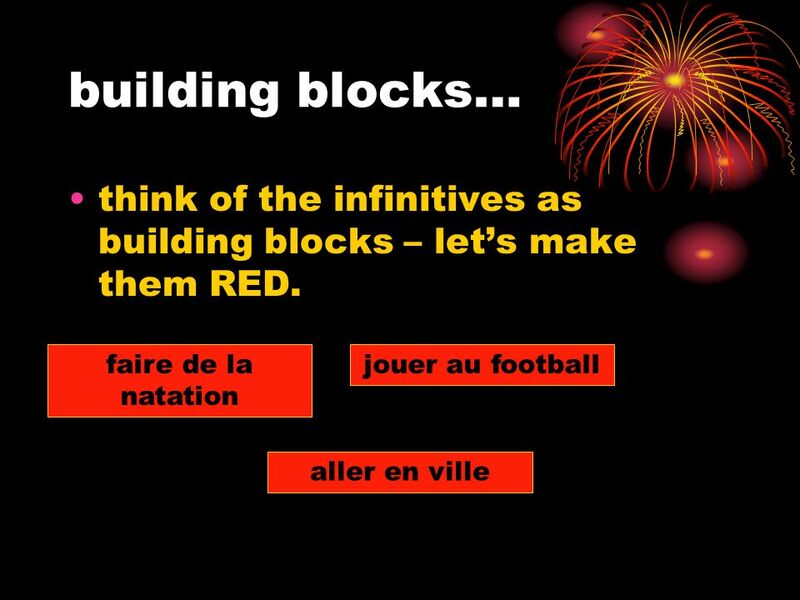 3 You will be successful if you can describe what an infinitive is and combine it with at least one other verb to build a sentence! 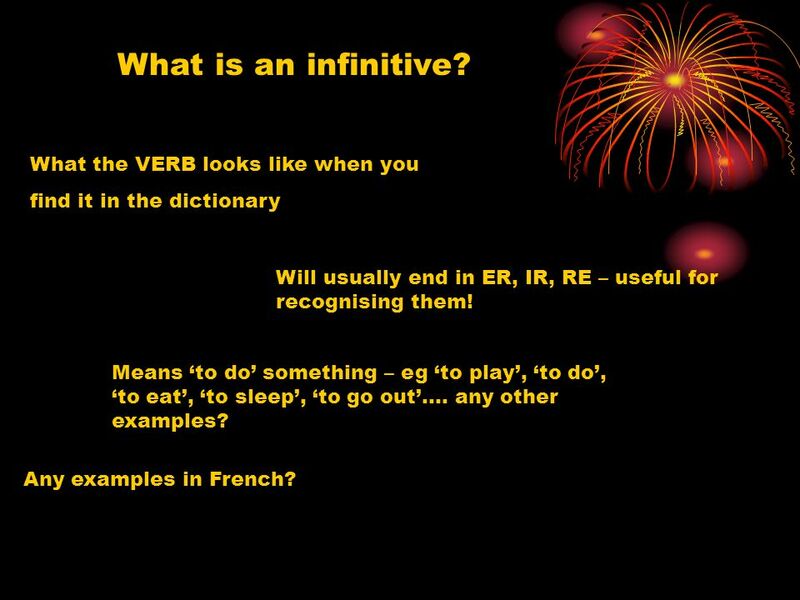 4 What is an infinitive? 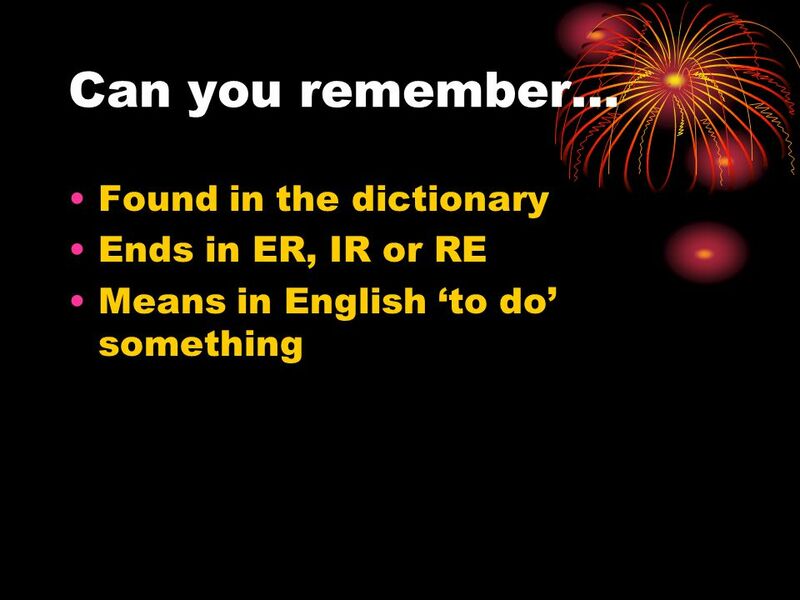 What the VERB looks like when you find it in the dictionary Will usually end in ER, IR, RE – useful for recognising them! Means to do something – eg to play, to do, to eat, to sleep, to go out…. any other examples? 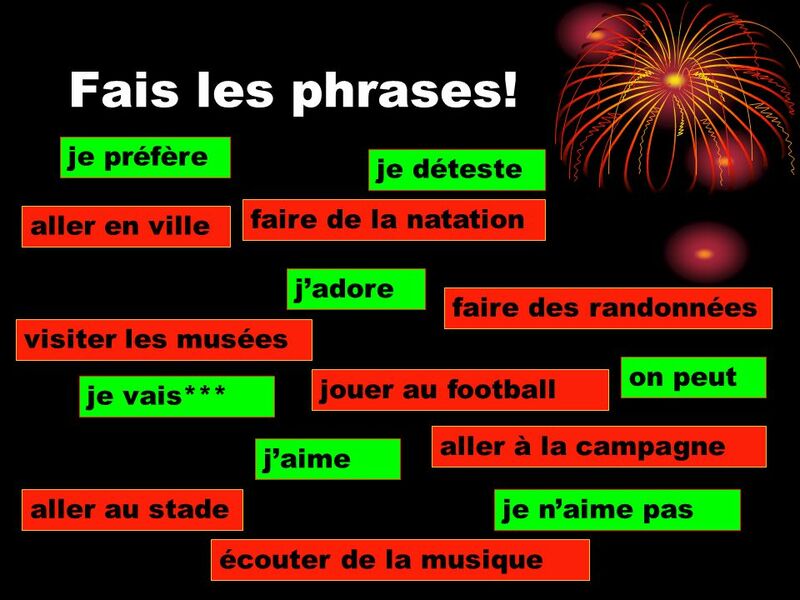 Any examples in French? 6 Are they infinitives? 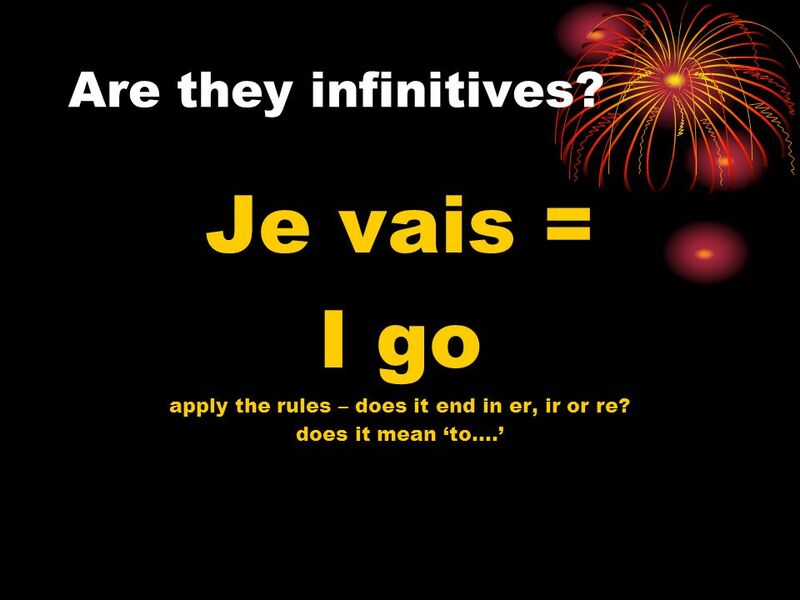 Je vais = I go apply the rules – does it end in er, ir or re? does it mean to…. 7 Are they infinitives? 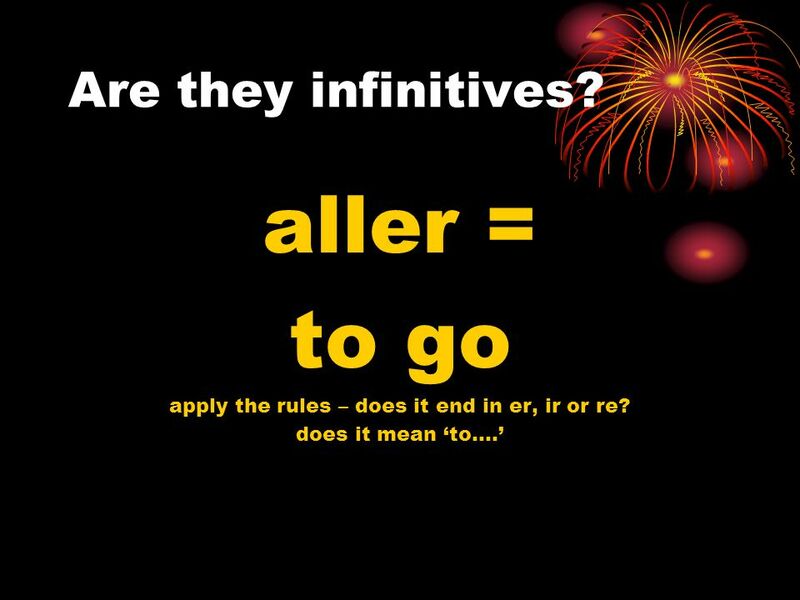 aller = to go apply the rules – does it end in er, ir or re? does it mean to…. 8 Are they infinitives? 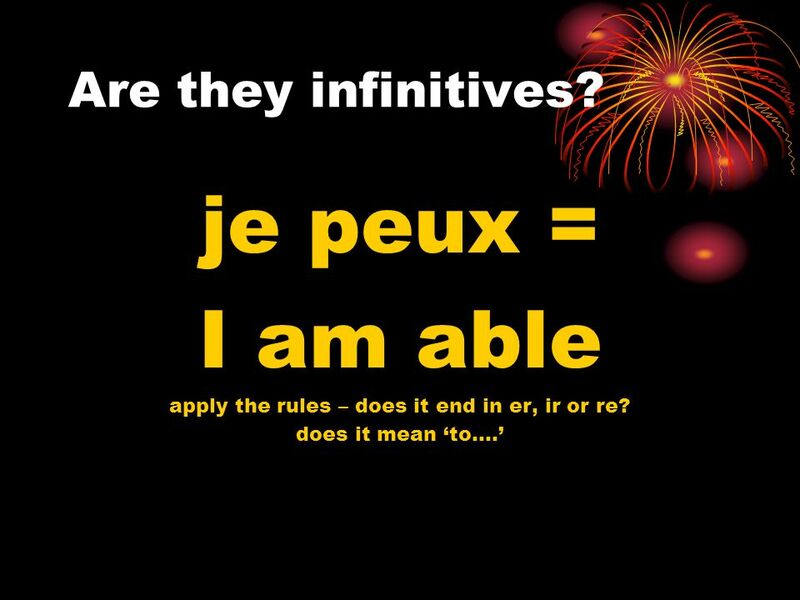 je peux = I am able apply the rules – does it end in er, ir or re? does it mean to…. 9 Are they infinitives? 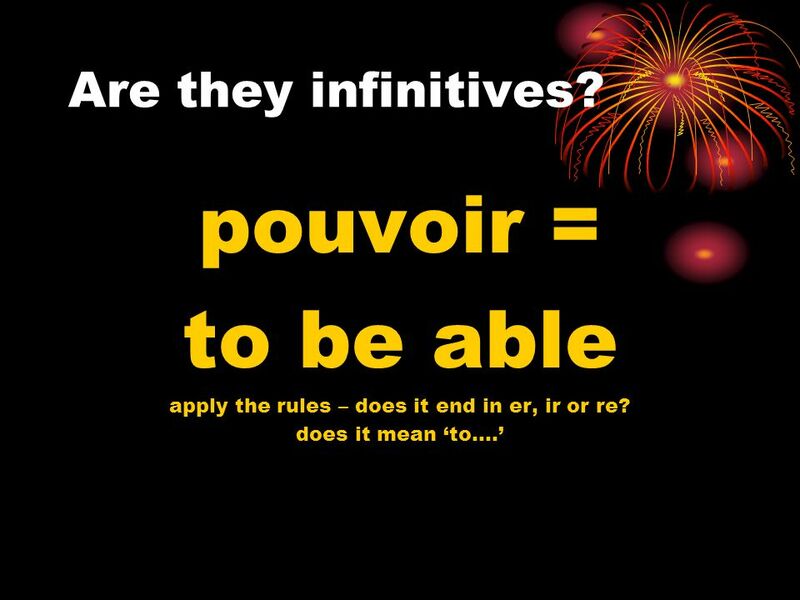 pouvoir = to be able apply the rules – does it end in er, ir or re? does it mean to…. 10 Are they infinitives? 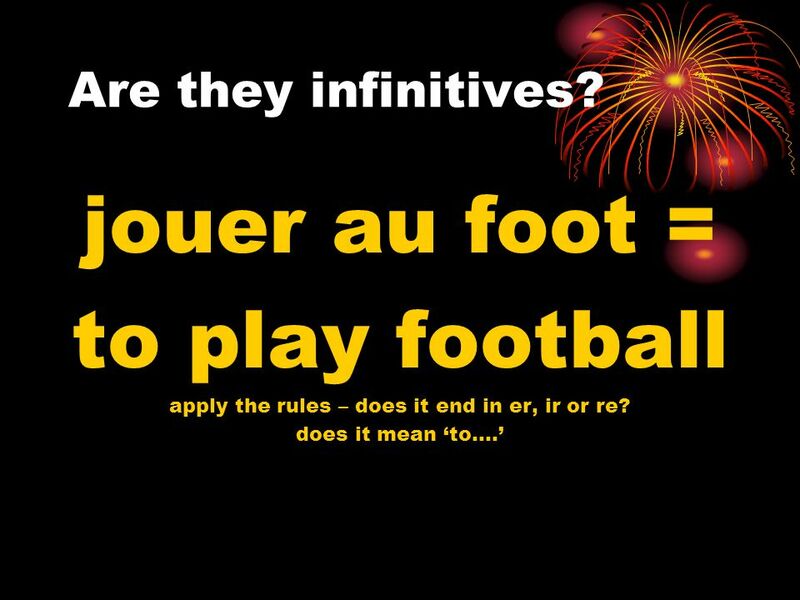 jouer au foot = to play football apply the rules – does it end in er, ir or re? does it mean to…. 11 Are they infinitives? 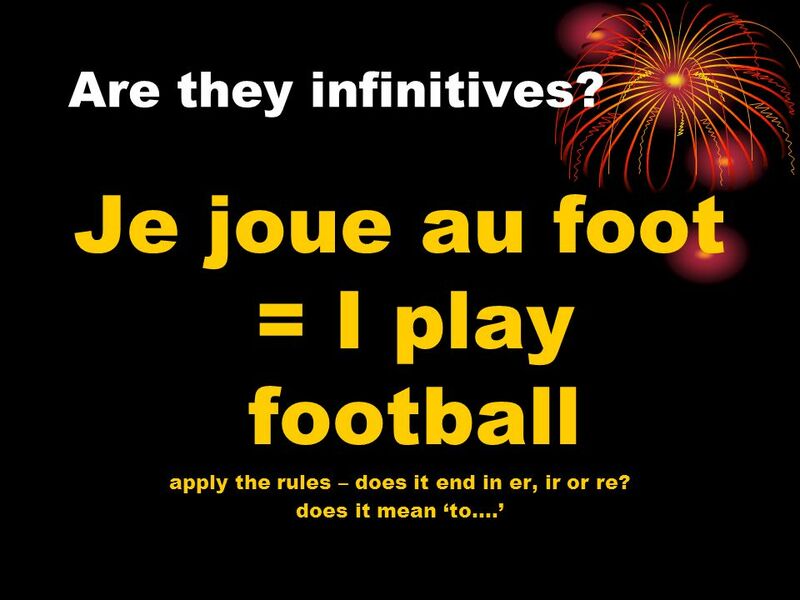 Je joue au foot = I play football apply the rules – does it end in er, ir or re? does it mean to…. 12 Are they infinitives? 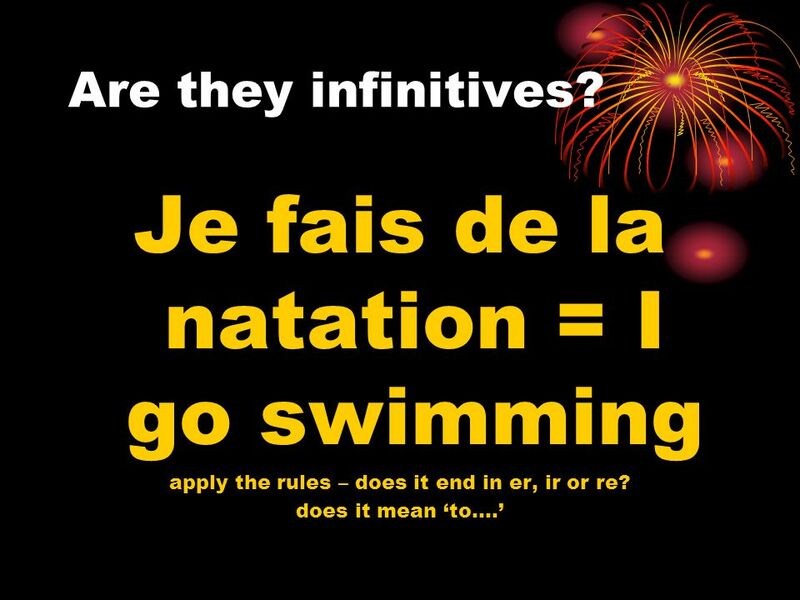 Je fais de la natation = I go swimming apply the rules – does it end in er, ir or re? does it mean to…. 13 Are they infinitives? 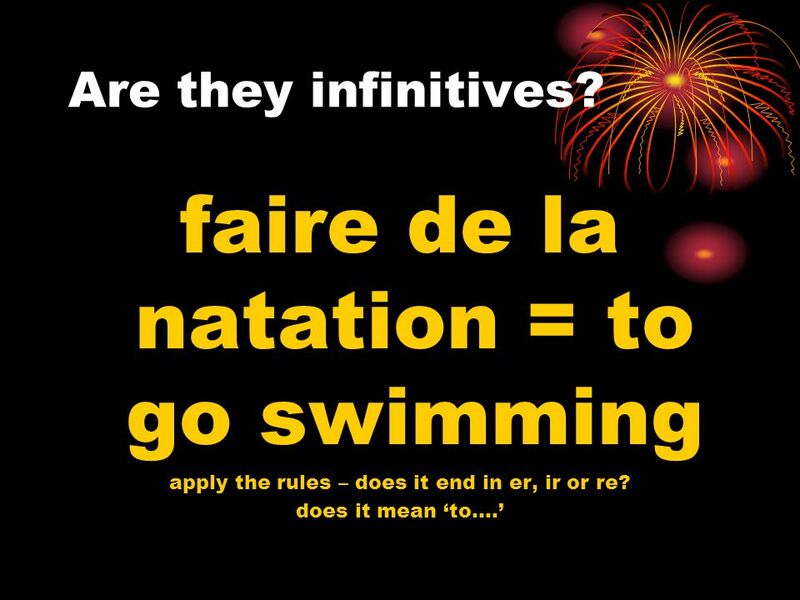 faire de la natation = to go swimming apply the rules – does it end in er, ir or re? does it mean to…. 14 Are they infinitives? 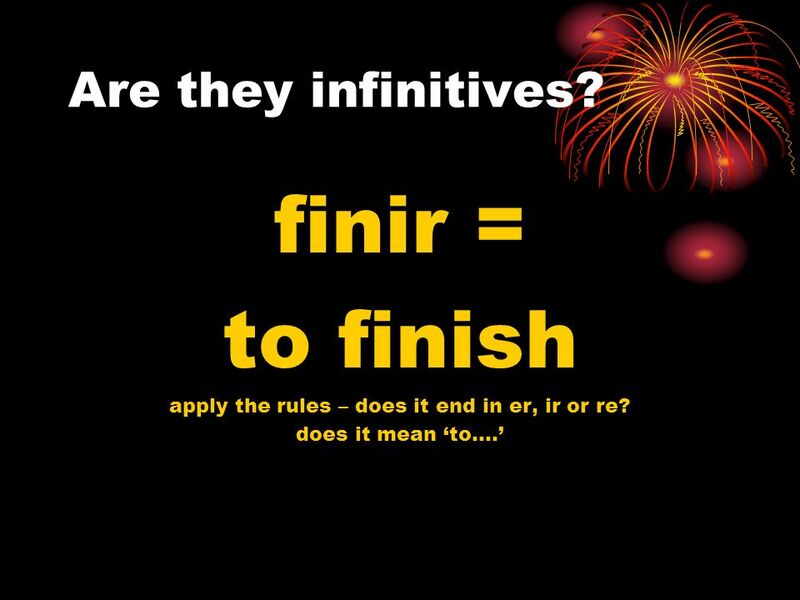 finir = to finish apply the rules – does it end in er, ir or re? does it mean to…. 15 Are they infinitives? 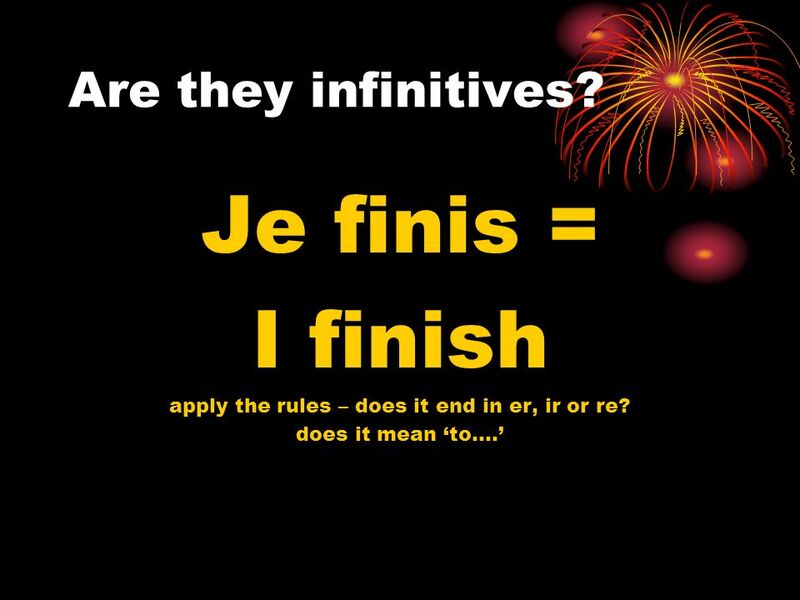 Je finis = I finish apply the rules – does it end in er, ir or re? does it mean to…. 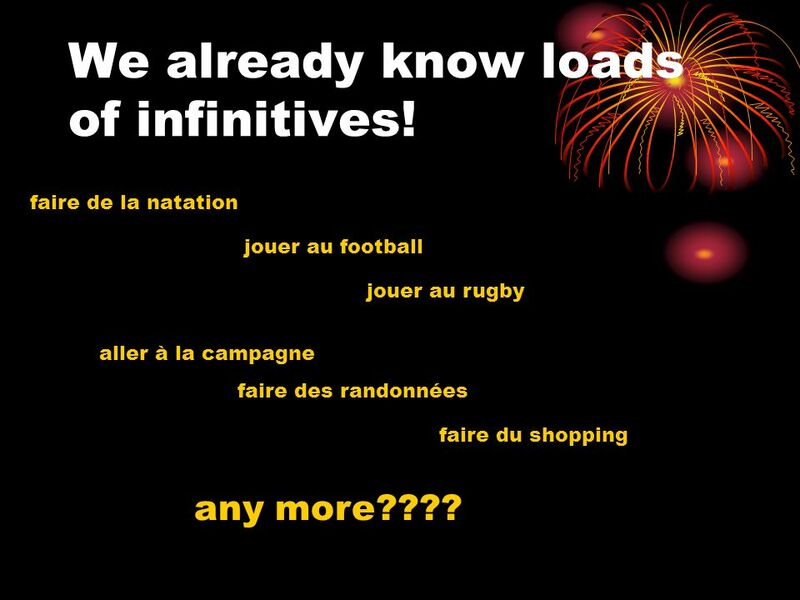 17 We already know loads of infinitives! faire de la natation jouer au football jouer au rugby aller à la campagne faire des randonnées faire du shopping any more???? 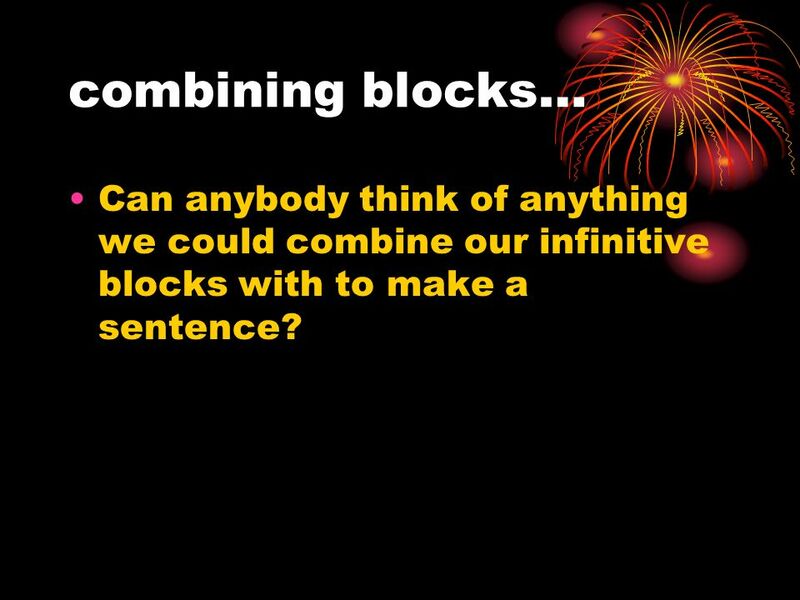 20 combining blocks… Can anybody think of anything we could combine our infinitive blocks with to make a sentence? 21 jaime = I like Does it make sense? I liketo play football jaimejouer au football Yes! 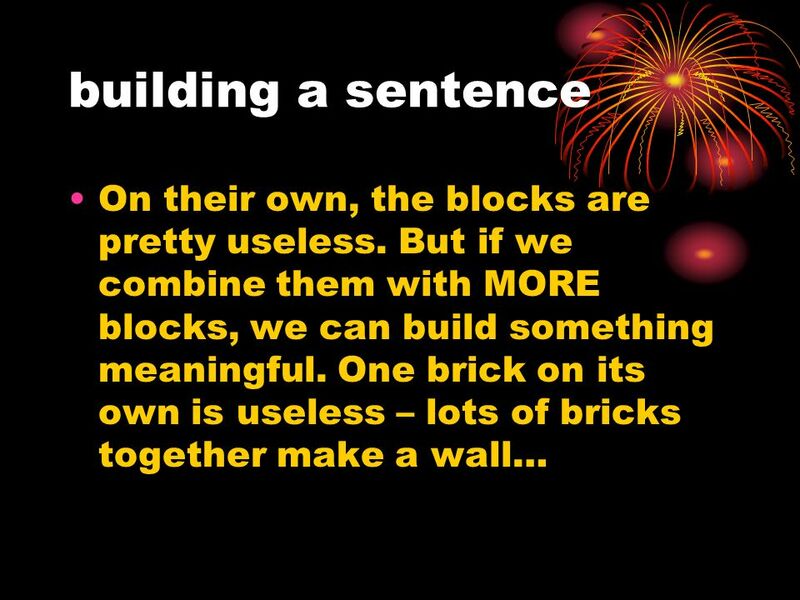 By adding another building block (jaime) weve built a sentence which means something! 22 je naime pas = I dont like Does it make sense? I dont liketo play football je naime pasjouer au football Yes! 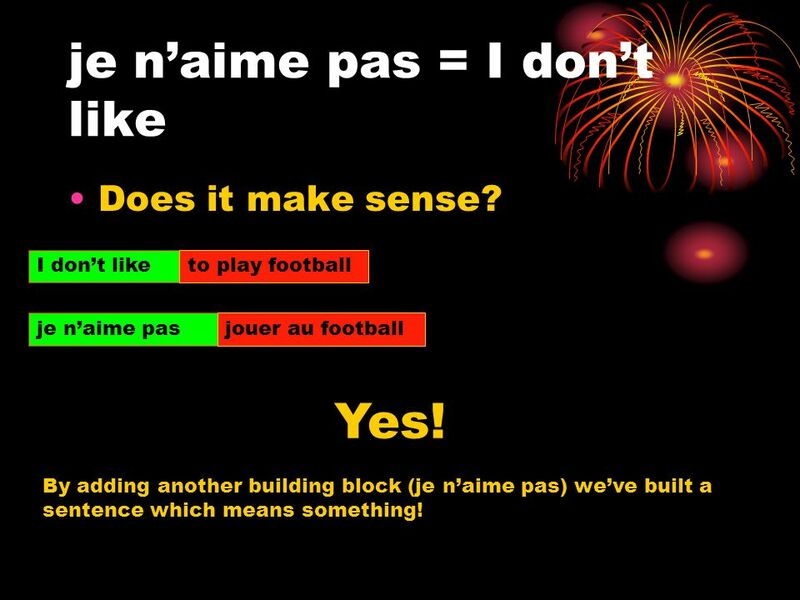 By adding another building block (je naime pas) weve built a sentence which means something! 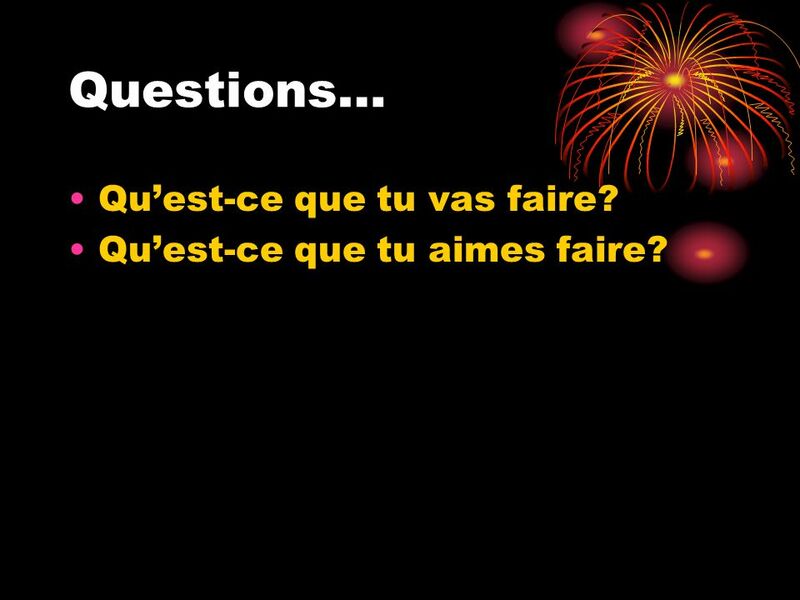 25 Questions… Quest-ce que tu vas faire? Quest-ce que tu aimes faire? 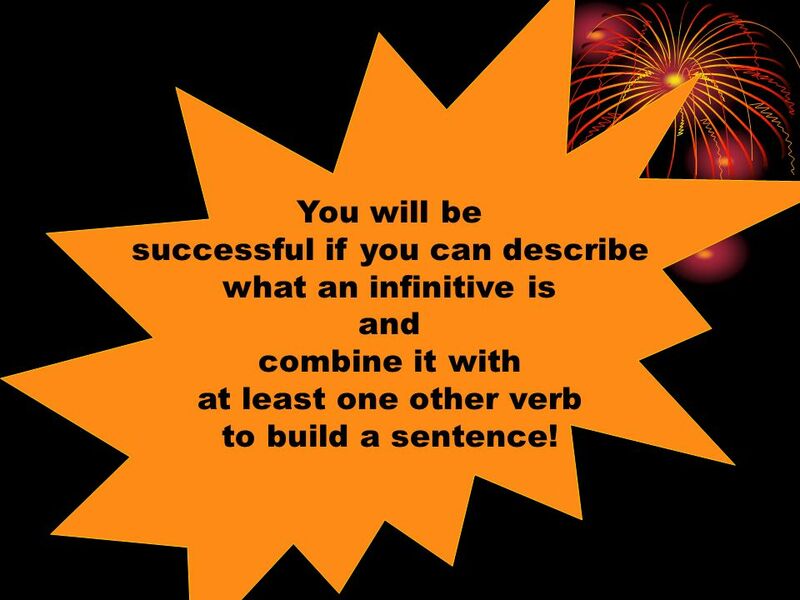 26 You will be successful if you can describe what an infinitive is and combine it with at least one other verb to build a sentence! 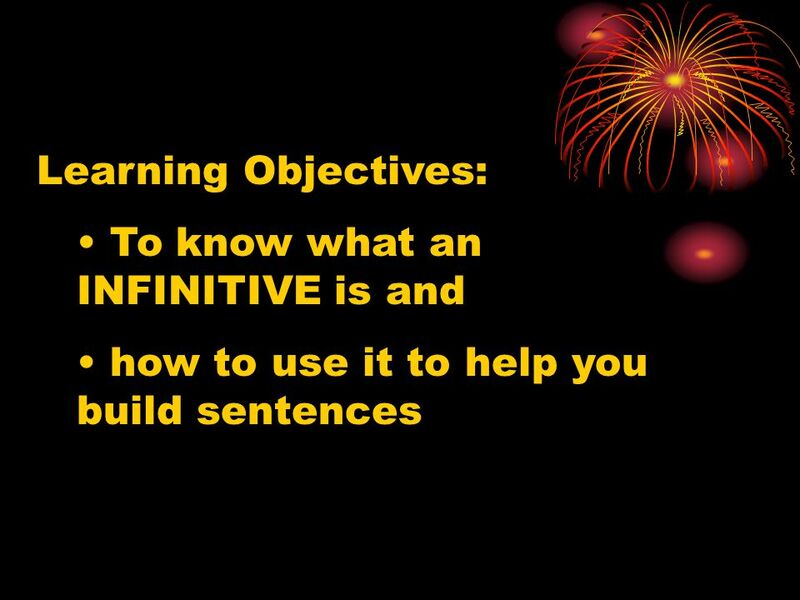 Download ppt "Learning Objectives: To know what an INFINITIVE is and how to use it to help you build sentences." Qu’est-ce que le Futur Proche????? Leçon 5 Vocabulaire Français I. Le sport to be able to say which sports we play and do jouer à / faire de. Le football: Starter Unscramble the letters to find the sports. 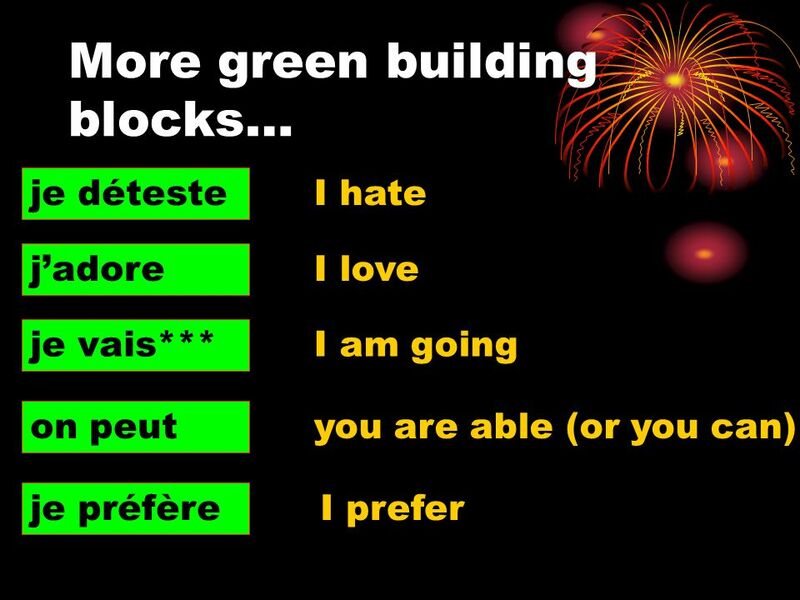 Français 1 – Unité 3 Vocabulaire. Pourquoi? To avoid restating a place or location, replace it with the pronoun y. The various rules are similar to the pronoun ens. Y also replaces any. 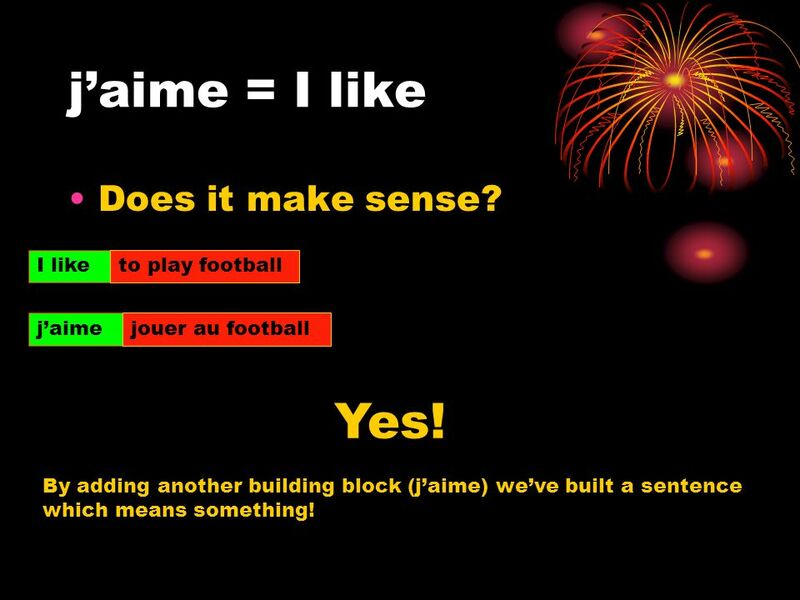 Starter: Put these sentences into order to represent your own views Jadore Bracknell Je naime pas le foot Jadore aller au cinéma Jaime le roller Je naime. Chapitre 2 Lesson 1 Le vocabulaire. 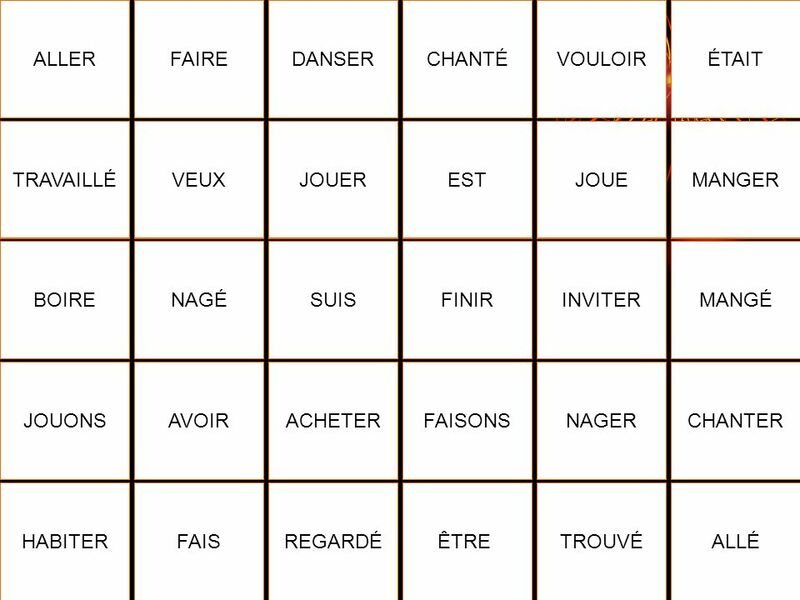 Chapitre 2 Lesson 1 Le vocabulaire. Sports you (and those you know) do how you spend your free time what you are planning to do next weekend what you usually eat and drink and your likes/dislikes.